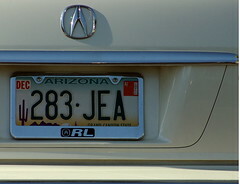 Police in Scottsdale, AZ are now using automatic license plate reader (ALRP) to scan all cars on the road within visual scanner range of a police car. What this means is that, if you are driving a stolen car, or of there are any known issues relating to the car or driver, such as a suspended license, or outstanding warrant, the police will be instantly alerted by the automated license plate scanner. For many people, the routine scanning and tracking of vehicles is very “big brother”, and brings up civil liberties issues, but courts have had no problems in affirming the rights of the police to do this. The bottom line, is that you just can’t expect to get away with driving while your license is under suspension or if you have any kind of old warrant for failure to appear in court. Even legal issues that are decades old can suddenly show up on computer records that are shared with police and law enforcement agencies nationwide. Please contact our Arizona law offices to help you get out from under any outstanding warrant, failure to appear in court, or related criminal legal problem, before it is too late. If you are pulled over and arrested, you will lose the leverage you may have in dealing with a problem pro actively, and negotiating a good outcome. i was pulled over for doing 31 in a 25mph zone. 3 doors from my home. pissed but know prob…i was legal having gotten my license back two months earlier.